Palazzo Caprara is located at Via Quattro Novembre, 24. The palace was later owned by Eugéne de Beauharnais, and later still by the duc de Montpensier. 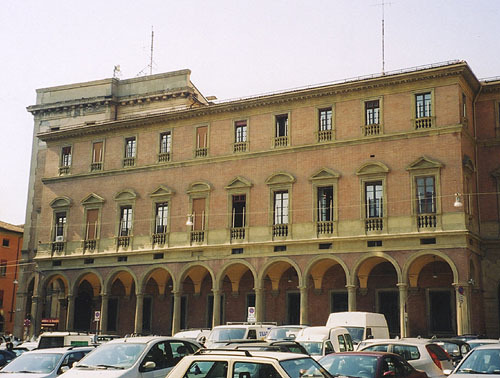 Today it houses the Prefettura of Bologna. 1 Alice Shield, Henry Stuart, Cardinal of York, and His Times (London: Longmans, Green, 1908), 149. 2 Presumably Maria Vittoria Caprara was a near relative (perhaps the niece) of Cardinal Alessandro Caprara, Protector of England (1626-1711); it was he who took to Loreto the golden angel given by Queen Mary Beatrice in 1687. In 1723 Maria Vittoria Caprara married Count Francesco Raimondo Montecuccoli; they were the parents of Cardinal Giovanni Battista Caprara Montecuccoli. 3 A.E.W. Mason, Clementina (London: Methuen, 1901). 4 Cf. Bonaventure Boylan, "A Journal of the Arrest and Escape of the Princess Sobieski", in Narratives of the Detention, Liberation and Marriage of Maria Clementina Stuart, styled Queen of Great Britain and Ireland, edited by John T. Gilbert. (Dublin: Joseph Dollard, 1894), 28-29. 5 Mary Jane Cryan, Travels to Tuscany and Northern Lazio. (Vetralla, Italy: Davide Ghaleb, 2004), 56-57, 242. This page is maintained by Noel S. McFerran (noel.mcferran@rogers.com) and was last updated March 21, 2006.